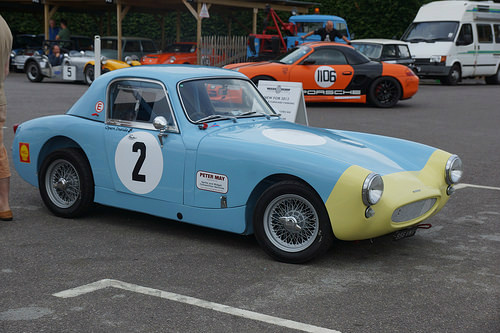 In 1958, an uprated version of the production Austin-Healey Sprite sports car, with Girling disc brakes and improvements to the engine and chassis, was cleared by the FIA to be entered on the track. Consequently, a small number (6-8) of Sebring Sprites were produced, up to 1961, with an aluminium alloy/fibreglass coupe body and a curb weight of 669 kg. It was powered by a 934 cc, straight-4, OHV engine that developed 55 bhp at 5800 rpm and 59 ft/lbs of torque at 3000 rpm, and produced a top speed of 88 mph, with 0-60 in 14.3 secs. Fitted with larger twin SU carbs, a racing clutch and close ratio gearbox, the works team took positions 1-3 class wins in the 1959 Sebring 12 Hour race, followed by a class win in 1960 as well. Over the years, privateers raced and rallied the cars with much success, and the Sebring Sprite sports car was regarded with pride amongst Austin Healey followers.